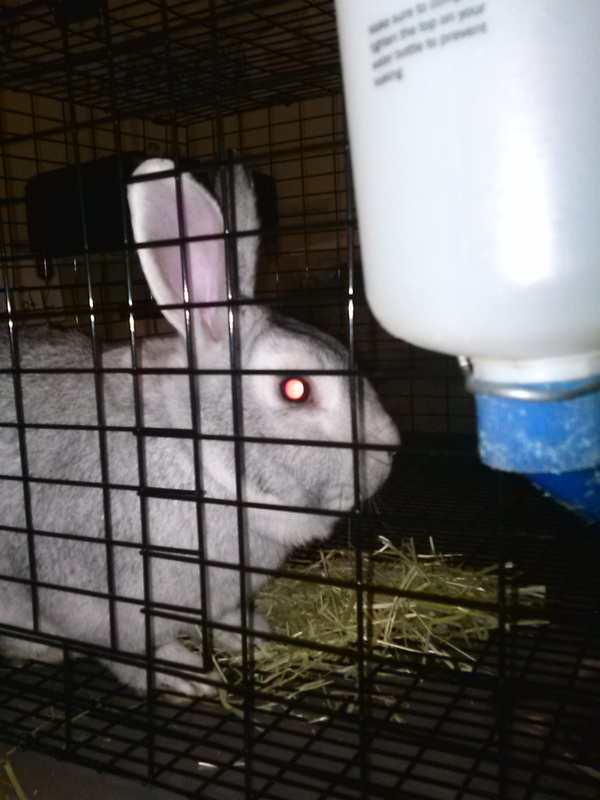 I had originally planned on getting rabbits this summer for my farm. Over the last few months, with all the projects and things we had going on, I had given up on it for this year. I figured next year we’d build a hutch and look for rabbits then. I occasionally browse the Farm & Garden section of our local Craigslist just to see what is out there, and I hadn’t seen what we were looking for anyway. My plan was to get 2 females (does) and a male (buck). Most ads I’ve seen have been for one rabbit, or one rabbit that was only for use as a pet (or like a floppy eared bunny that wasn’t really a meat rabbit anyway). 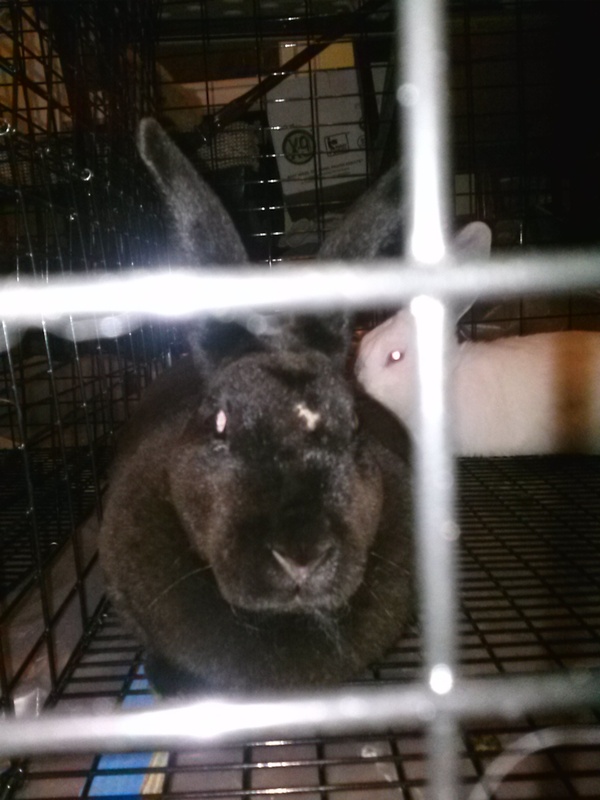 Last Thursday, I saw an ad for exactly what we wanted: 2 does, a buck, and a hutch, for $30. It was in Marquette which is a couple hours away. I immediately called, and told the guy I’d take them if he could wait till Saturday for me to come get them. He agreed. As soon as I got off the phone, I realized I had no way to get the rabbit hutch, since our truck is currently not working. I called the guy back and asked for the dimensions of the hutch. My car is a station wagon (Toyota Matrix) and the seats fold completely flat. I can fit large things in my car, IF I can get them in the door. From the dimensions, it sounded like I could fit the hutch. I called my cousin who actually lives near the craiglist guy, and he said he could help with his truck, at least to get the hutch, and then we could try to get the hutch into my car at his house. I drove 2 hours in the pouring rain, to my cousin’s house. From there, we went to get the rabbits. 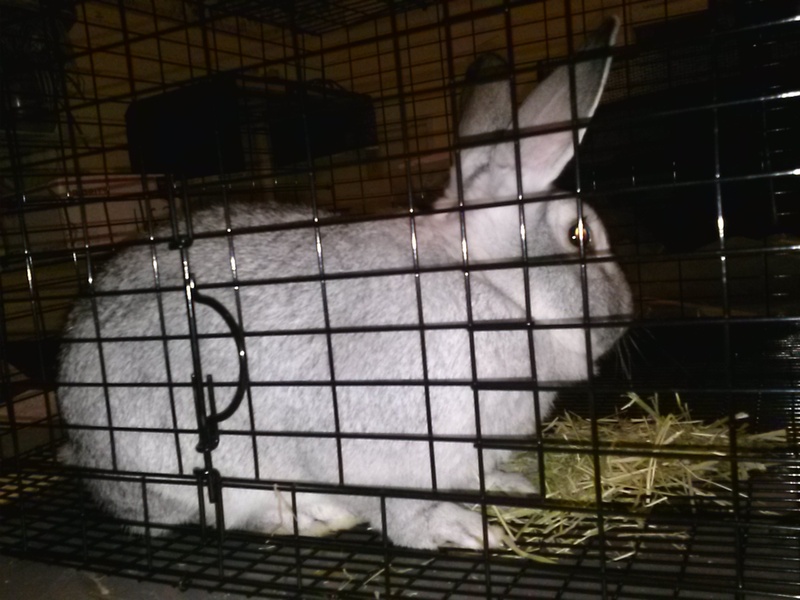 We got the rabbits in the truck, and the hutch in the bed of the truck. We got back to my cousin’s house, and there was no way we could get the hutch in my car – the opening is not large enough – it was only a couple inches too small, but with the pouring rain, we weren’t going to try to mess with it. So my cousin is holding the hutch for me, for when my truck is fixed. I stopped at Tractor Supply on the way home, to get the rabbits food and see if they had something I could house them in temporarily, while we build a hutch – the truck will take a little longer, but we can build a hutch this week. I found 2 cages, and that is where the rabbits are for now; of course they are inside, because the cages are too flimsy to be out in the weather, with predators about. 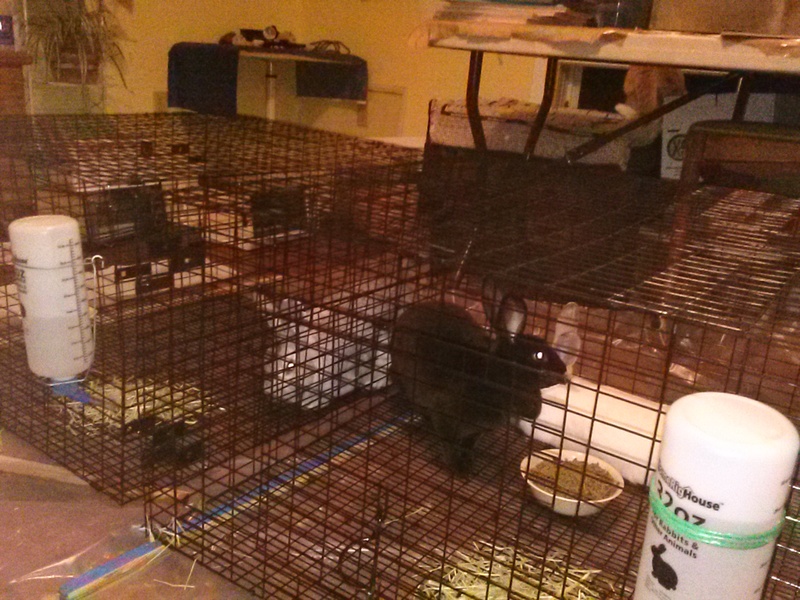 Here are the rabbits in their temporary cages, in my art/livestock room. There is a black female (I guess she is a Rex), a white female, and a big grey buck. The guy I got them from had the black female together with the male. He said she’s due to have a litter soon (within 2 weeks). We were going to get them settled in before breeding them; so this puts a bit more of a rush on things. We started building a hutch for them yesterday, it will have 3 compartments so they all have their own cage, and it’s wood on 3 sides, with cage material front doors. There will be hardware cloth/cage material in between each compartment so they will still be able to see each other. We are using wood on 3 sides to help keep wind and blowing snow/rain off of them. For the floor, we are using some “bread trays” that I found. When I was a kid, the downstairs of our house was a store, and the bread came to the store on these large plastic trays. My parents used those as the floors of rabbit hutches when I was a kid, because you can slide them out for easier cleaning. 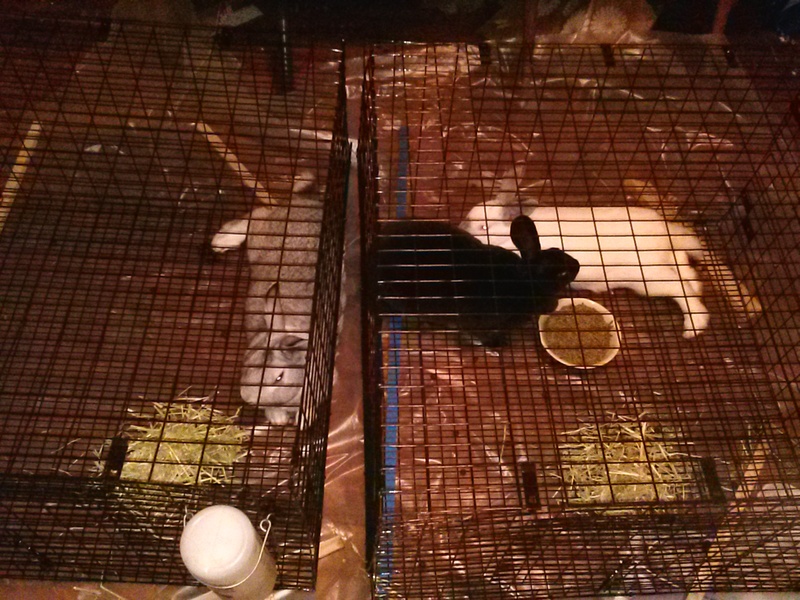 I like that the floor has openings, but it’s smoother than using hardware cloth or cage-material flooring, so it should be nicer for the rabbits to sit/stand/lay on than cage material would be. We just need to make/attach the doors, and make some legs, and add the roof. We are using some metal shelving I found for the roof, so they will have a sloped metal roof – the snow will slide off the back of the hutch. I will do another post with pictures of the hutch soon. Back to the rabbits… We have not really named them yet, but since they are our breeding stock we actually are going to allow ourselves to name them. My son has picked a couple of names for the buck, who is his favorite; He keeps changing his mind on the name though. The big gray buck. He is the size of our (large) cat. Here is our black Rex doe. She has a big scar on her head, with actual teeth marks. She looks like she got in some kind of rabbit fight at some point. It’s healed up but it looks like possibly a permanent scar. 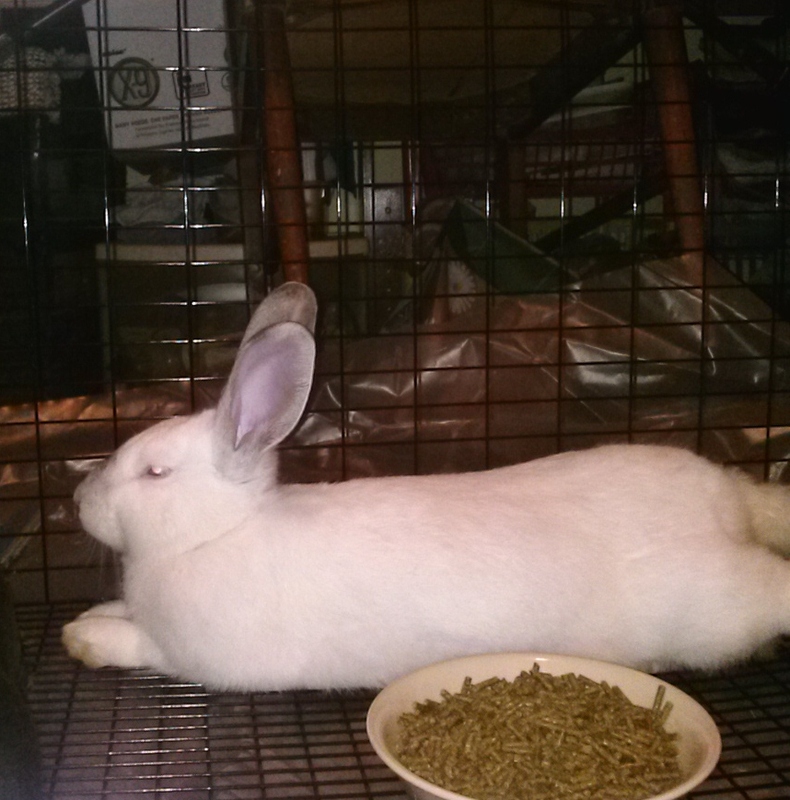 She has extremely soft fur, and I read that Rex rabbits are usually bred for their fur. She feels like a squirmy fur coat when you hold her. Here is our white doe, she has pink eyes, but she has splashes of grey on her nose and ears. So, in the end, I now have rabbits for my farm. I did what I didn’t want to do, and got animals with nowhere to really put them – I do have temporary housing, but that was so not my plan. It will work out, the hutch will be good, and should be ready in the next few days. I have a nest box that I gave to the ladies, for the black doe to start nesting in, but she used it as a litter box. Maybe in her permanent home (or closer to her due date) she’ll start pulling her fur out to line the box instead of pooping in it. We are going to put the rabbit hutch in our chicken pen (the rabbits were near a lot of chickens and ducks at their last home), for ease of access this winter. Fall is definitely here. We’ve had lower temps – 50s and 60s. We got a touch of frost – I saw some on the grass one morning. But I think my house is in a bit of a microclimate – in our town there was a hard frost at the end of September, where you had to scrape frost off your windows. We didn’t get that here – I’m only about 12 miles outside of town, but the way our property is situated we sometimes are spared from the frost. I was worried things would die, so when we got the hard-frost warnings, I harvested everything in the gardens that was anywhere near being ready. I didn’t worry about things that can deal with frost, like Kale. And then nothing happened, my plants that were left out there are all still doing fine. Here’s a photo tour of how things are looking lately. 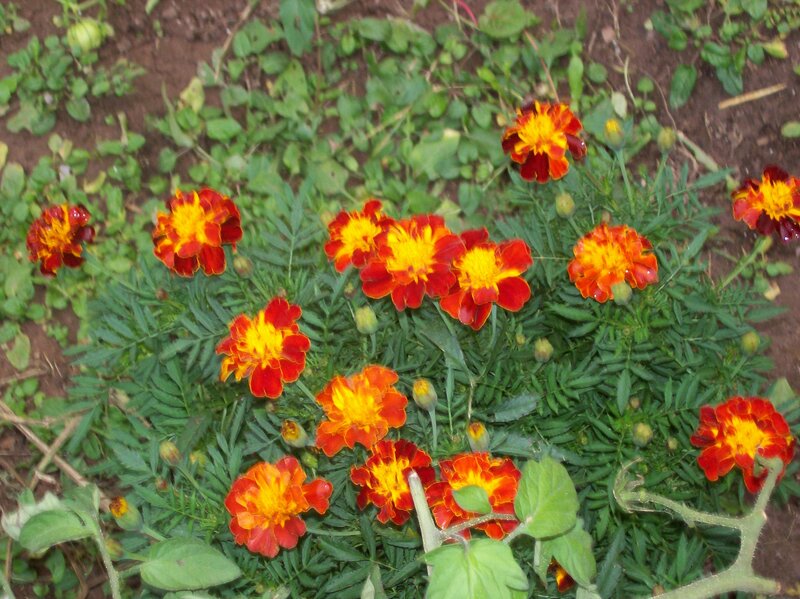 Here’s what my garden looks like – a tangled mess with not much left for picking. I’m debating on whether to pick everything out, and cover it all with compost now, or wait and do that all in the spring. Either way, the soil will have a layer of plants between it and the snow; I’ve read that is better for any mycelium networks (which are very helpful for your plants) – if you leave bare soil any beneficial mycelium that may be there can die, and you are depleting your soil. That is why people plant cover crops – I don’t really want to do that because we really don’t have time. Last year, we got snow at the beginning of November. I don’t think a cover crop would have time to sprout and grow. 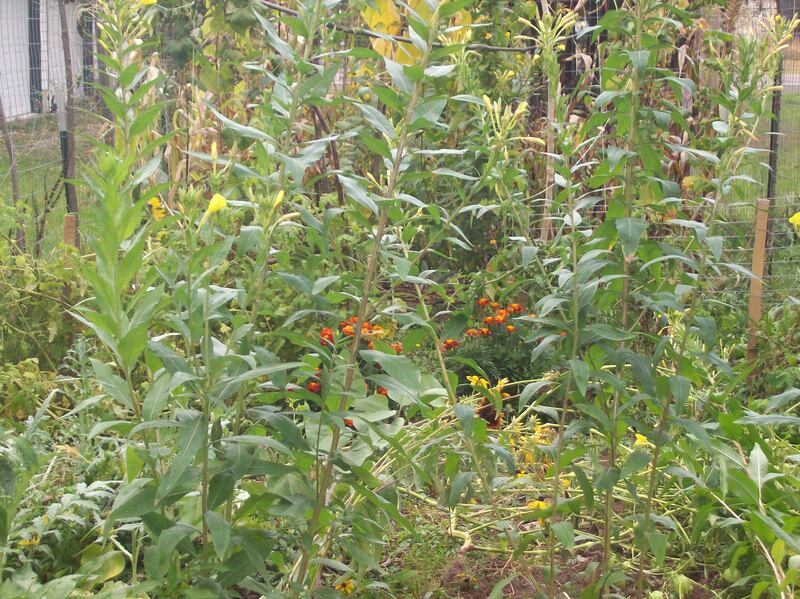 So I may just use my already-there crops as “cover crops”; then in spring, I’ll pile on compost, and till it all in. (I’ll still have to pull big stems out, like the old corn and sunflowers). 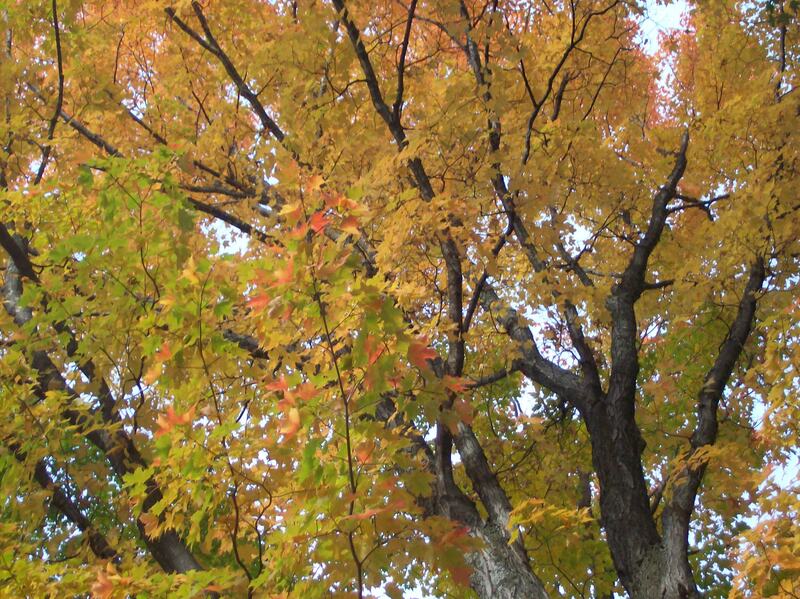 Our trees are very colorful – they had just started changing last week and then suddenly everything’s orange, red, and yellow (with a touch of green). 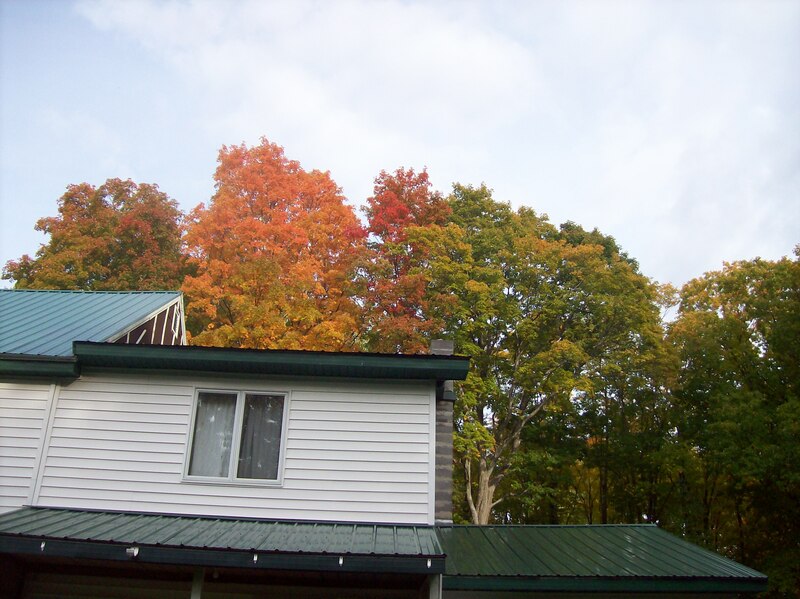 Here are some of the trees in our yard. Another picture of those trees. 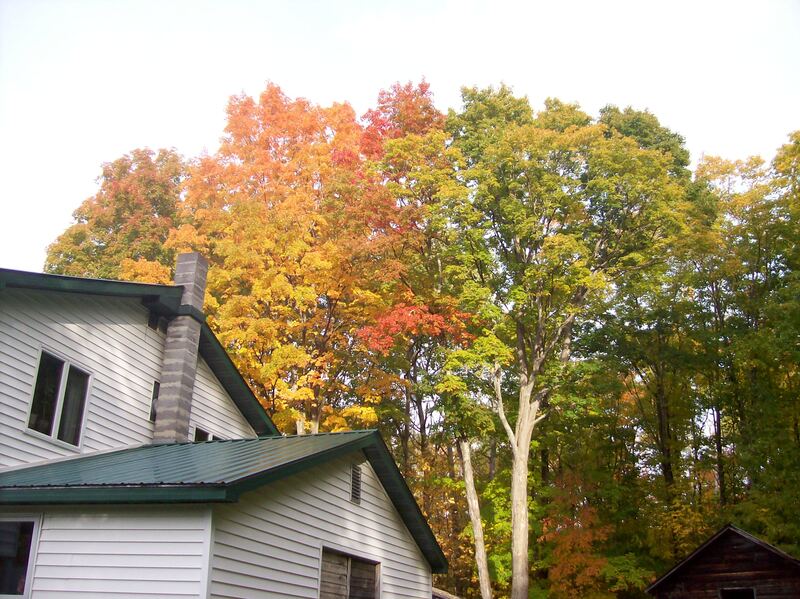 Here are the maple trees that we get sap from in the spring. 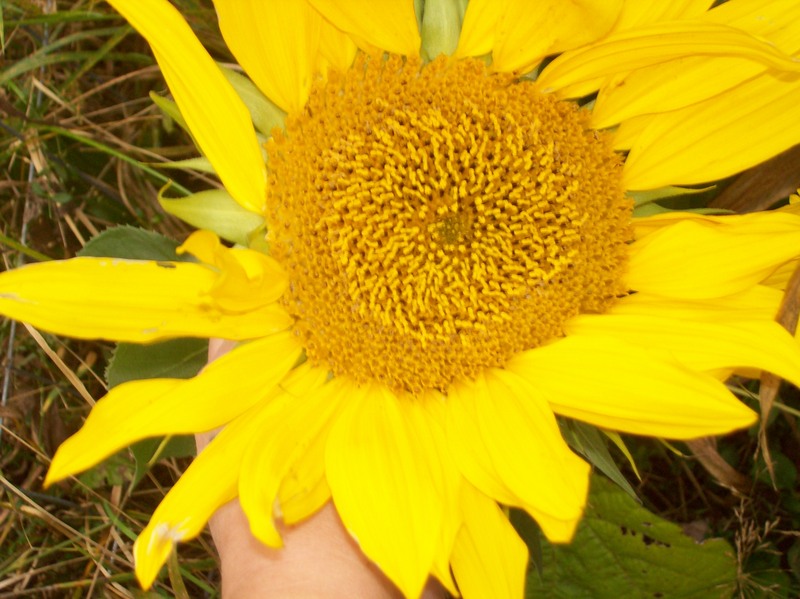 My maybe-last sunflower for the year. Our apple trees are doing well. 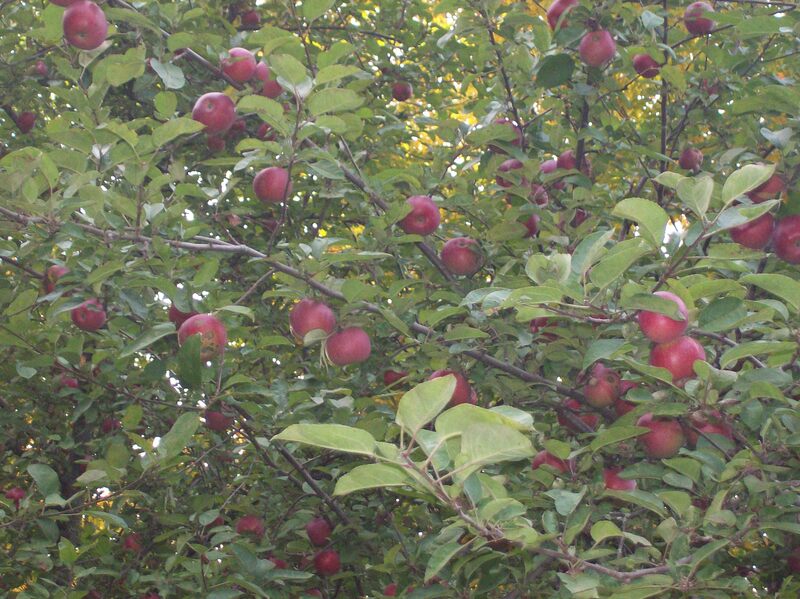 The biggest problem is that most of the good looking apples are way up on the tree. I’m planning on picking a bunch more this weekend. I picked a few several weeks ago and made apple butter. I’m planning on making some more (since it’s delicious) and also drying some apples for snacks. 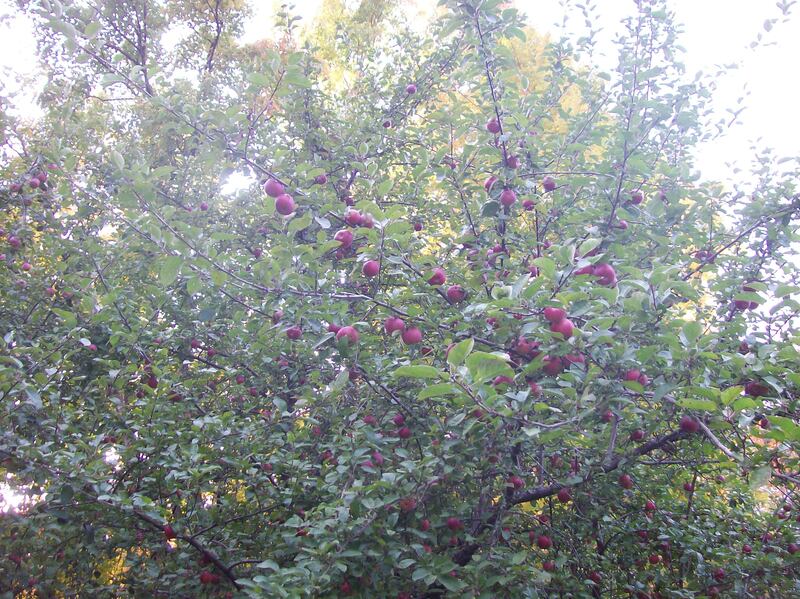 One of the apple trees. A closer view of those yummy apples. 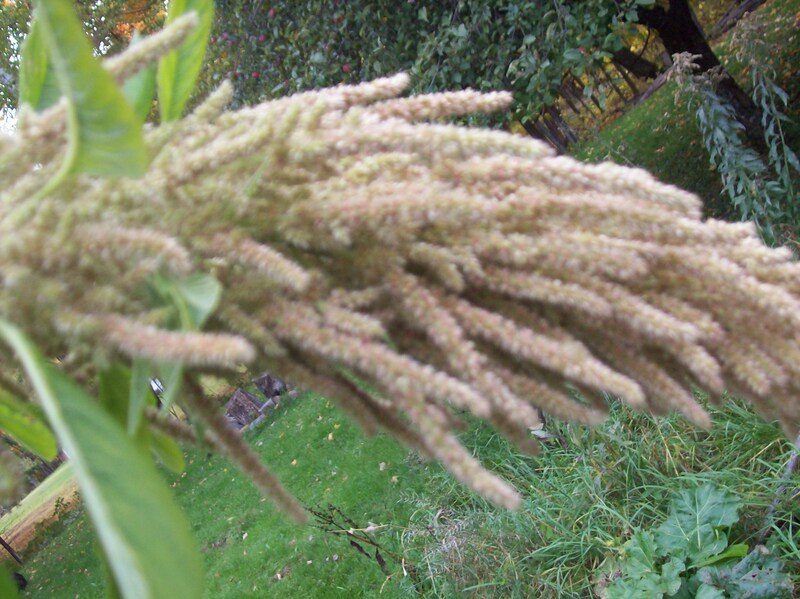 Here’s one of my Amaranth, it is a good 8-9 feet tall. 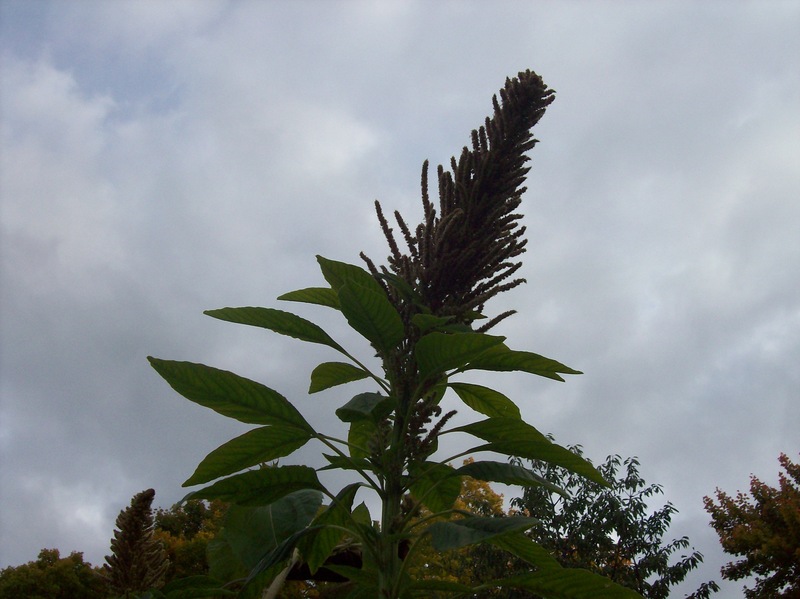 Here is the same plant, I leaned it over so I could get a detail of the flower. 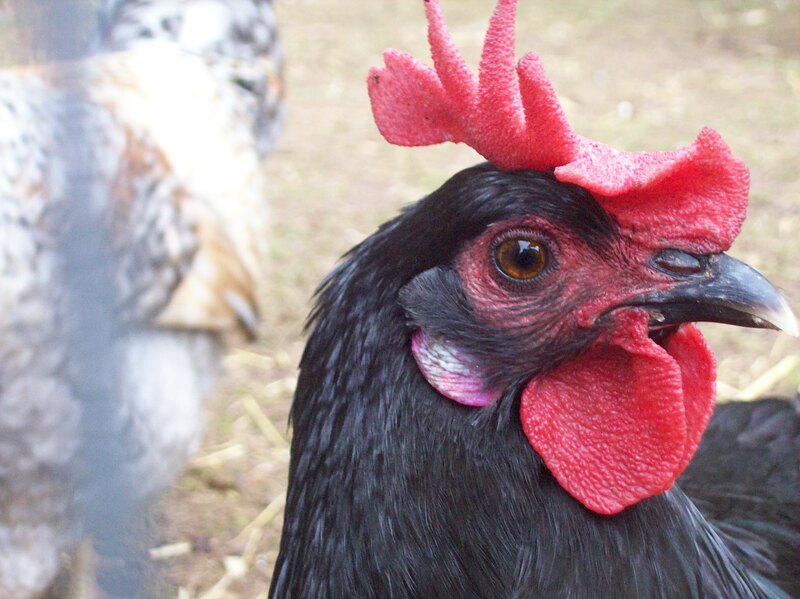 Here is one of my australorp hens wearing her apron. It doesn’t help her wing “elbows”, as you can see here, but her back is protected. 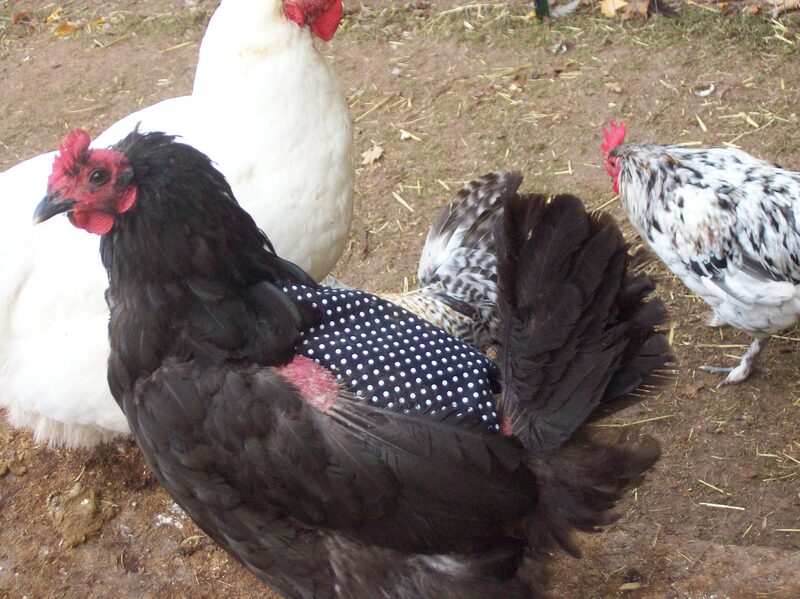 I also thought the aprons would help keep the hens a little warmer this winter. Some of my hens still have completely bare backs, and I was worried about winter because with no feathers there, they would be too exposed to the cold. 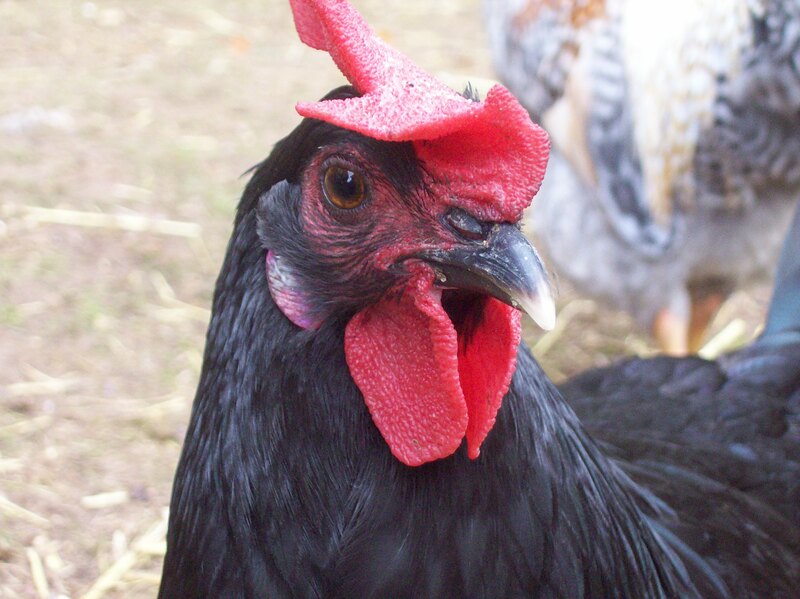 They work pretty well, I do have a few hens that these seem a bit too big for. I ordered some standard size aprons from someone on Amazon. They do have some smaller ones, I may have to get some of those. Mine are all “standard” breeds but some are on the smallish side. I have a barred rock hen that these didn’t fit – it’s like the middle bit of the apron is too wide to fit between her shoulders, so she just kept getting tangled up in it. I only tried it on her for an hour or two, and then I had to take it off. She doesn’t have a name except “Escape artist” because if anyone gets out, it is usually her. And she gets out almost every other day. She must fly out, but then she can’t fly back in for some reason so I have to catch her and put her back in the run. She sleeps in the rafters of the coop now, and she’s actually gotten one of her friends (my Cornish hen) to sleep up there with her. Thanks for checking out my Fall farm pics. I do like fall, but it always leads to winter, which I’m not really looking forward to.